What is Bio-Multi Vitamin and Minerals? Bio-Multivitamin & Mineral is a composite nutritional supplement containing a range of antioxidant vitamins and minerals, together with other relevant micronutrients. Bio-Multivitamin & Mineral does not contain iron because antioxidants act within the body in a synergistic (mutually supportive) manner, multiple supplements are more effective than large amounts of single antioxidants, hence the rationale for Bio-Multivitamin & Mineral. Antioxidant levels may be depleted in individuals consuming a diet with a high content of convenience foods. Therefore, a multivitamin and mineral complex can be essential. Free radicals are toxic chemicals produced within the body as unwanted by-products of normal metabolism. Additional free radicals may be generated following exposure of the body to toxic chemicals (e.g. pesticides, vehicle emissions), ultra-violet light, smoking and drinking alcohol. The body is protected against free radical attack by substances called antioxidants. Some antioxidants are manufactured within the body, and others must be obtained from the diet. Some types of antioxidant (e.g. vitamin E) are fat soluble, and preferentially protect lipid components of cells (cell membranes) from damage, whilst water-soluble antioxidant types (e.g. vitamin C) protect the main body (cytoplasm) of the cell. An imbalance between free radical generating and protective systems is known as oxidative stress. Avoidance of oxidative stress helps to maintain healthy cardiovascular, nervous, digestive and immune systems. Take a look at our Pharma Nord Omega 7 Sea Buckthorn Oil and Pharma Nord Bio-Fish Oil to find out more about the benefits Pharma Nord products have to offer. 1-2 tablets per day, or as directed by a physician. To be taken with food. Level of individual components are within recommended safety limits for maximum daily intake. Below are reviews of Bio-Multi Vitamin and Mineral - 150 Tablets by bodykind customers. If you have tried this product we'd love to hear what you think so please leave a review. 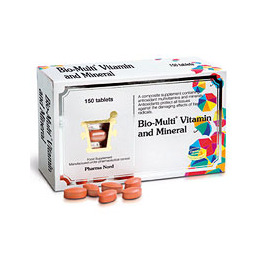 Bio-Multivitamin & Mineral is a composite nutritional supplement containing a range of antioxidant vitamins and minerals.